This evening I made another batch of my Cheese Pinwheel Rolls and tweaked them slightly. They turned out great! We enjoyed them fresh and hot out of the oven along with last night's leftover Instant Pot Spicy Chicken Chili. These rolls are based on a slightly modified version of my Cheese Head Pizza Crust dough. I've increased the eggs, added baking powder and made a few other changes. You simply press or roll the dough out to an approximate 10" x 15" rectangle and scatter shredded cheese over top of the dough (I used shredded 3-Alarm Spicy Pepper Jack Cheese and Parmesan). 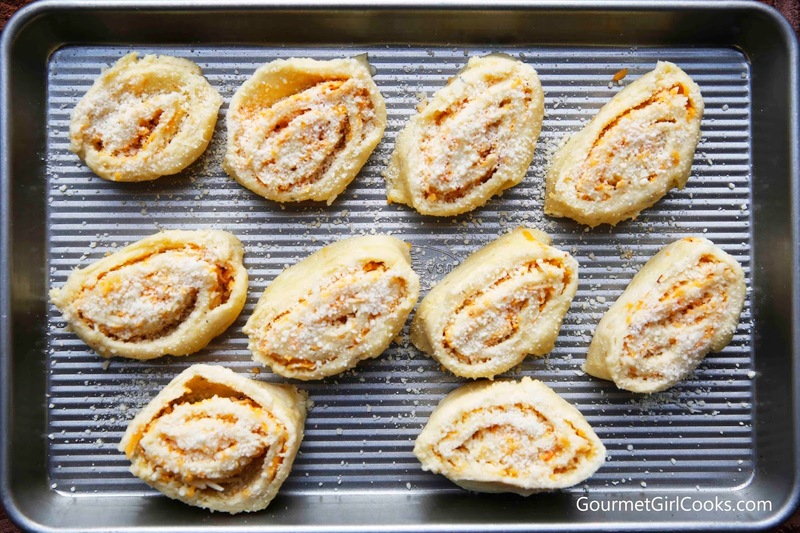 After spreading a layer of cheese on top of the dough, you gently roll and nudge the dough with a rubber spatula on one end to begin rolling it into a log that you cut into pinwheels and lay flat on a baking sheet to bake. They turned out unbelievably good! They were flavorful and bready with the familiar chewiness found in regular bread. They can be easily be modified and you can change them up by adding other ingredients to them as well. You could easily scatter some browned ground sausage along with the shredded cheese and make Sausage Cheese Pinwheels to enjoy alongside your eggs in the morning. I may give that a try soon myself. They are super easy to make and if you lightly oil the sheet of parchment that's used to assist rolling the dough into a log it's as easy as pie to do. I hope you give these rolls a try and enjoy them as much as we did. I snapped a couple photos of tonight's Cheese Pinwheel Rolls below as well as included the recipe. Enjoy! Place mozzarella and cream cheese in a medium bowl. Heat cheese in microwave on high for 45 seconds; stir and heat an additional 45 seconds to 1 minute, or until a hot melted mass of cheese is formed. While cheese is melting in microwave, combine almond flour, 1/4 cup Parmesan, salt, baking powder, garlic powder and Italian seasoning together in a small bowl. Add the flour mixture, beaten eggs, and 1 tablespoon olive oil to bowl of hot melted cheese. Quickly fold and stir mixture together with a rubber spatula until a ball of dough is formed (make sure cheese mixture is hot before adding flour and egg). If necessary, microwave for an additional 15 seconds to keep cheese pliable and melted as it is mixed together. Place ball of dough in center of the lightly oiled parchment paper. Pour remaining tablespoon of olive oil on top of the dough and press and spread the dough out evenly into a rectangular shape about 10" x 15" using a rubber spatula (if necessary, lightly oil rubber spatula to keep it from sticking to dough). Spread or roll dough out to a rectangle about ¼-inch thick. Lightly scatter 1 tablespoon Parmesan over top of dough. Top evenly with shredded cheese. Begin lifting the narrower 10" end of parchment, using your rubber spatula to gently nudge the end of dough over to begin rolling. Roll the dough by steadily lifting the parchment paper as you go, rolling it into a log. Once it's completely rolled into a log, use a sharp knife to cut dough log into approximately 10 1-inch thick round pinwheels (or 12 3/4-inch thick pinwheels). Place on parchment lined (or lightly greased) baking sheet, spacing about 1 to 2 inches apart. Sprinkle lightly with remaining tablespoon of Parmesan. Bake for 20 to 25 minutes or until golden brown and done. Can you suggest a work around for those of us without a microwave? Wouldn't it be delicious with a little smear of pizza/tomato sauce. OMG! Although perfect "as is" in addition with soup. Thanks for this recipe! It's the closest thing to a "dinner roll" that we've had in 4 years! My dough was quite sticky and I didn't have the defined pinwheel effect that you did, but I went ahead with it and they tasted so good even though they didn't look like yours! I'd like to try spreading some roasted garlic on the dough next time for a "garlic roll". BTW, love the photos of Spike at his new home! I think they'd make a good "open house" or "change of address" card! Enjoy your new home! This is a fabulous recipe! Especially easy if you have made the "cheesehead" pizza crust and are familiar with the melting cheese technique, which is super easy in the microwave. Even the rolling up into a pinwheel bit was easy. Reminded me of making jelly rolls with my grandmother as a child. Anyway,I just used some leftover Mexican 4 cheese blend that was very finely grated, and it covered the dough perfectly. These rolls also were great leftover, lightly toasted. Next time I am going to try them with sharp cheddar and some dried piment pepper for a pimento cheese effect. My husband wondered out loud if you could make them like a danish, with blueberries and ricotta rolled up inside and then drizzled with come sort of cream cheese icing ... any ideas on that one? Thanks again for your yummy wheat-free creative recipes! Hi Cammie...check out my post today -- as my guest post for Honeyville, I actually made something similar to what your husband "wondered about". 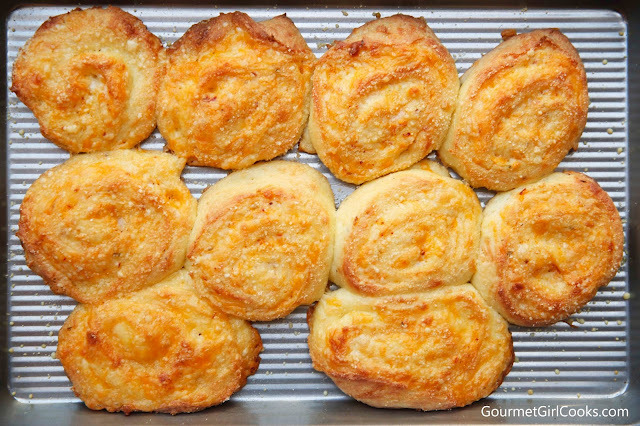 Last week, I just so happened to make a sweet roll version using the basic cheese dough recipe but tweaked it to make it sweet instead of savory! You could certainly swap out blueberries or whatever you wanted in place of the cranberry sauce. Let me know how you like them if you give them a try. I tried making calzones with this dough and was mostly successful (I've missed calzone so much!) This time I mixed it in my stand mixer and used the dough hooks, because I have a hard time mixing this dough either by hand or with a hand mixer. I found it very helpful. My dough was still a bit sticky, though. Do you know the remedy for this? More flour maybe? The calzones also spread a bit more than I wanted and did not look as nice as the traditional ones I used to make, but they tasted great! Yay!